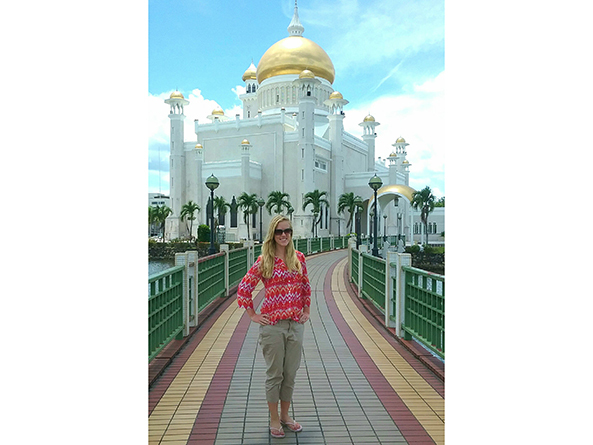 Above: Sen. Julie Slama visited Sultan Omar Ali Saifuddin Mosque in Brunei during a 2017 trip through Southeast Asia. Peru Sen. Julie Slama should probably be in class right now. While most new state senators are learning to balance their public service with work responsibilities, Slama is figuring out how to serve the constituents of District 1 and finish her spring semester legal writing course. While being appointed one of the youngest senators in the history of the Unicameral in December 2018 was not exactly in her five-year plan, Slama has never backed down from taking on a challenge. She grew up a mile and a half southeast of Peru, with her parents and two siblings: fraternal twin sister Emily, and younger sister Melanie. After graduating from Auburn High School, Slama decided to take the first of many big leaps—she applied to Yale University. What would drive a small-town high school student to attend one of the most prestigious universities in the country? While studying political science and government, she had the opportunity to travel the world. So far, Slama has visited 31 different countries, 22 of which were solo adventures. Visiting 10 southeast Asian countries to research her senior capstone project stands out as one of her favorite trips. While there, she had the opportunity to study and compare Asian regional governance structures with those of the European Union. But one nonacademic memory that stands out is of a taxi driver in Myanmar. When she wasn’t busy forging important diplomatic bonds through the power of rock music, Slama found time to conquer Wheel of Fortune. She made it to the final puzzle during a 2016 appearance on the popular game show, but was one consonant short of winning it all. “The phrase ‘bright glow’ will haunt me for the rest of my life,” she said. Slama graduated from Yale one semester early, returning to her hometown to work as a paraprofessional and volunteer as a high school track coach. There was never a question that she would return, she said, because Nebraska is home. Growing up in such a tight-knit community will inform her work as a state senator, she said.